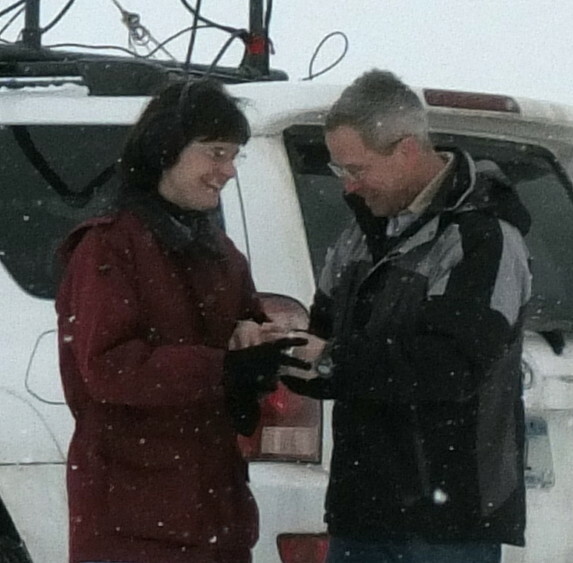 The Engagement Rove: She said "Yes!" Click on ANY image for a larger image. Janice and I had a blast in last year's Jan VHF Contest. It was her first VHF contest and her first from the rover. It was a trial by fire juggling 5 microphones on 7 bands and selecting appropriate amplifiers for each transmission! 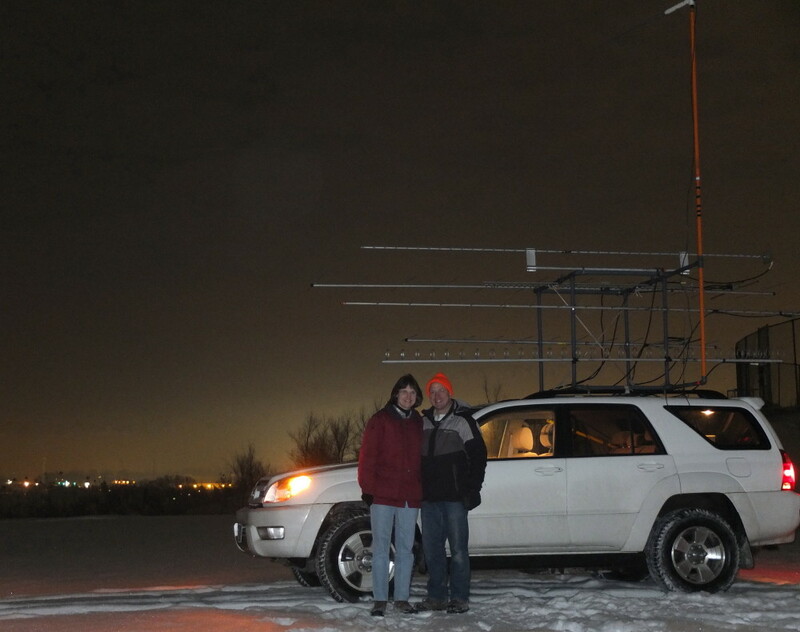 Since then we've roved in MN and IA state QSO parties (8 counties each), and the CQ-VHF contest from 6 grids. Field Day was portable with the Ozaukee Radio Club. From the cabin in Hillsboro, WI we took part in CQ WPX SSB, CQWW SSB and CW, ARRL DX SSB, ARRL SSB and CW Sweeps, ARRL 10m and 160m as well as several state QSO Parties. We hit IL, CA, and WI (QSO Parties) hard and dabbled in HI, KS, OH, PA, and IN7QPNE. So it's been a great year for ham radio for us. Along comes January and it's time for the ARRL January VHF Contest again. What should we do this year? What will weather and our lives permit? 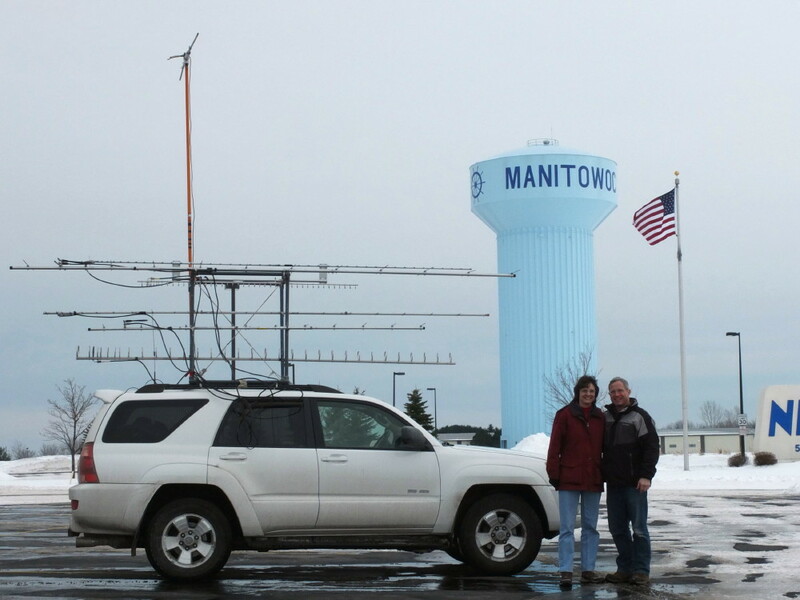 We both were excited to get back on VHF and work our friends in the region. Because of work demands it seemed to make the most sense to do the exact 7 grids we did last year. You can see the route we took on the first graphic to the left. We worked up a schedule that we thought we could stick to with time for driving, eating, and sleeping. We intentionally did not plan to activate EN54 because Gary ND9Z was planning to be on and he can give out that band on 6m through 2304. We distributed our planned schedule to email reflectors in the region as well as to a regional activity "spreadsheet" initiated by W0UC. So operators in the region knew where we would be and when. I built a googlemap showing our operating locations carefully/accurately placed on it. I loaded the radios in my garage up in the Twin Cities on Tuesday. It was COLD (again) in the garage on my knees routing wires and cables. I use canoe kneeling pads to help protect my knees during the hooking-up phase. I drove to the farm in Hillsboro for a few days of logging trees. 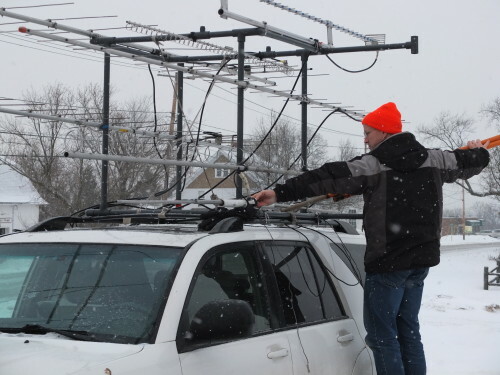 I got the antenna rack out of the barn and took advantage of moderate temps on Thursday to get it up on top of the car and strapped down. 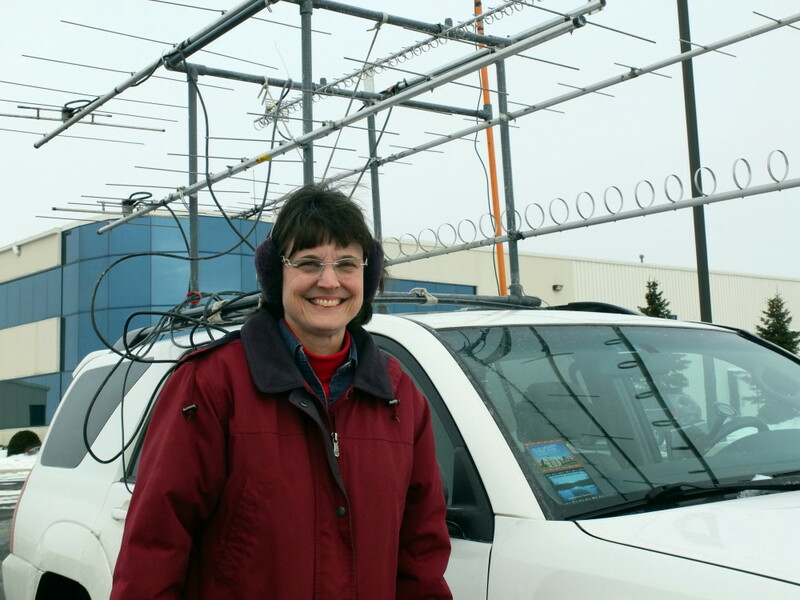 Janice and I met at AES Superfest in April 2012. We each knew there was something special about the other. Friendship, dating, and a blossoming relationship ensued. It's been a wonderful two years of courtship where we share common interests like hiking, canoeing, and ham radio. We resonate on so many frequencies! I knew I wanted a life with Janice--when to ask her to marry me? 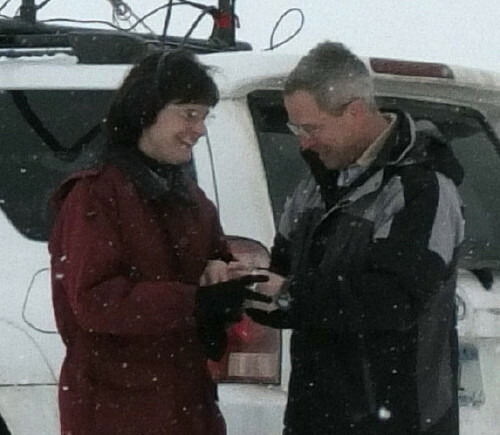 I decided to surprise her right at the start of our rove (on the north side of the Milwaukee Airport for EN62) for the January contest. We tend to take pictures at each of our operating locations. She set up the first shot not knowing what I had in mind. She tripped the timer on the camera and came trotting back to stand beside me. 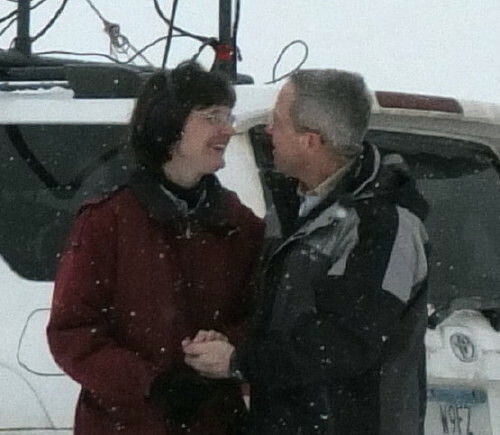 When she arrived beside me, I spun her towards me and dropped to one knee. 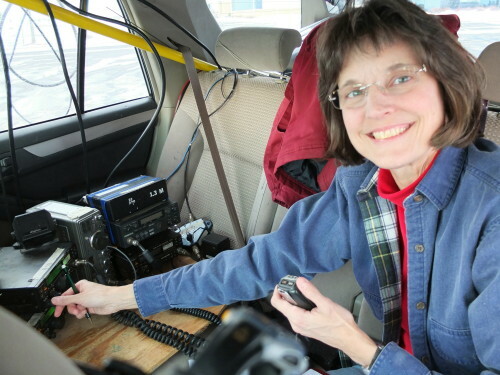 The camera fired about the time I began to tell her how important she is to me and that while ham radio roves are just one crazy adventure, I want her to be with me on ALL of this life's crazy adventures going forward. 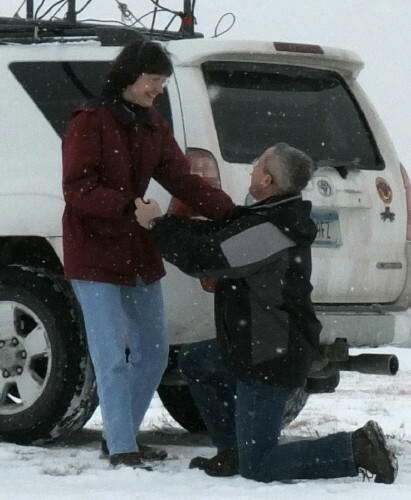 I asked her to marry me and she said "Yes!" Snowier and colder this year--temps in the mid-teens during the day on Saturday. You can see the light snow falling. While at this airport site, we finished by making our only 10GHz contact of the day. 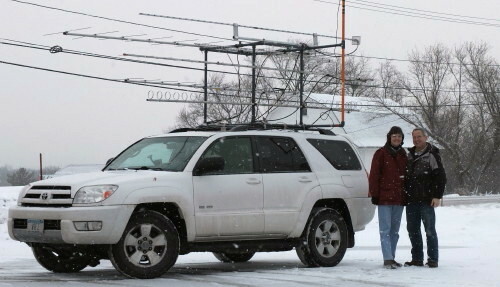 Jerry WA9O lives a few miles away and with his rig (dish) inside the house, he aimed out a window in our general direction. There was enough scatter that I found him pretty easily and we had about S2-3 signals. Our 2nd location was in the parking lot of a hair salon (formerly a fire station) on National Ave in New Berlin. We head on I-43 SW-bound and then get off at Racine Av (County Y) and go north to National Ave. then west just a 100 yards or so. It's always empty on Saturdays and Sundays so driving around in circles is no problem. Because the road is on a diagonal, sometimes it's tough to point in the right directions to peak up known stations. Long transmissions from them helps get them peaked up and sometimes the heading is not what we initially thought. This year we worked 36 different callsigns and 290 contacts. Notable are W9GA (38), W0UC (30), N9LB (29), K2DRH (27), N9DG (24), WA9O (18), N9ISN (15), W9RM (13), and K9MU (12). We worked some callsigns I've not worked in several years like WD9BGA, K0PG, W0VB, N9CIQ, and WA9PWP. Big rave reviews to AC0RA/R!!!! We worked them for 11 Q's in 3 grids over very non-trivial distances. They always sounded good on all four bands (6, 2, 222, and 432)! All the contacts are appreciated--even the ones where we only worked a station once. K2YAZ, ND9Z, and KC9BQA were noted by their absence from the airwaves that weekend. Our third location was Hillcrest Park in Waukesha, WI for EN53. This is a great location. After a sit-down dinner break at Culver's, we arrived in the dark at the site. The temps were dropping and were about 5 degrees when we finally took down for the night. I drove around in circles in the snow on the grass. Most of the time it was fine but I got stuck for a few minutes and wondered if things would get worse before they got better--but once I dropped the microphone and focussed on getting back to the area where we'd already mashed the snow down, it was fine again. 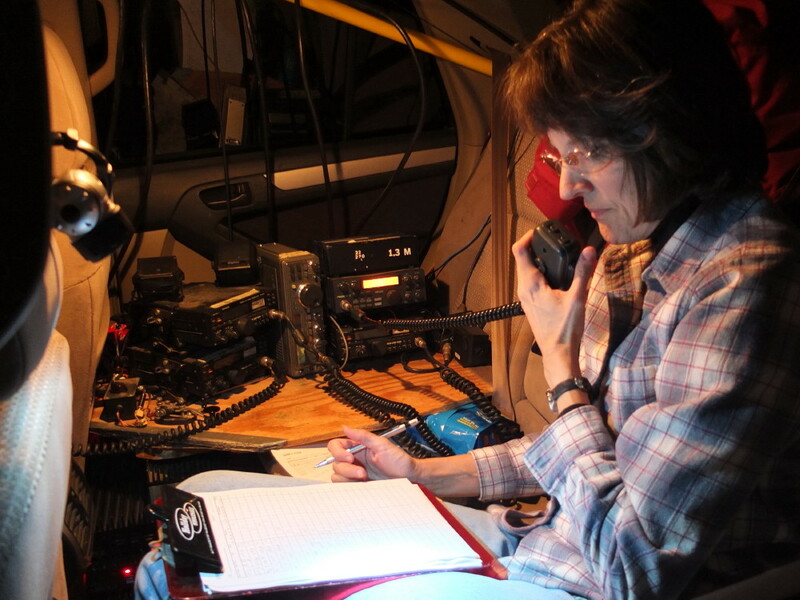 We put a head strap LED light on the driver's seat headrest facing down and back for lighting for Janice's clipboard. We put a watch with Z time on the back of the headrest as well. We don't operate on the fly. First, the beams are too pointy and we'd have to keep stopping to peak-up if someone did hear us. Also, it gives our ears a break. Janice comes back up to the front passenger seat and enjoys the scenery with me as we drive around this beautiful state. Sunday morning, we headed to Mee Kwon Park in Cedarburg for EN63. We got a slightly late start and arrived 30 minutes late. Turns out we had many stations looking for us at our scheduled start time. We will try harder to be on time in future roves. 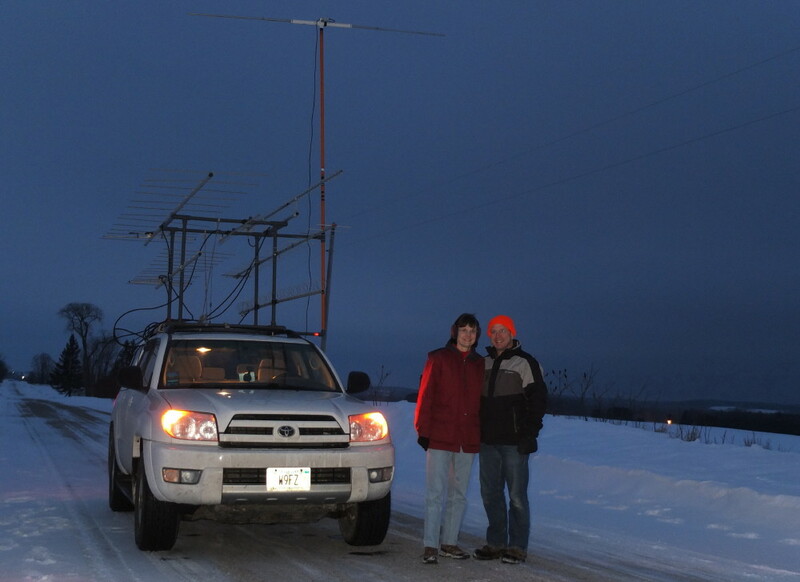 We appreciate Ken W9GA keeping tabs on us and spreading the word that we were running a little late. Conditions were good on 6 meters and average on 2 meters. I'd say they were below average on 222 and 432. On 903 and 1296 I'd say conditions were well below average. I suspect it was the nature of the humidity and weather fronts in the region at the time. 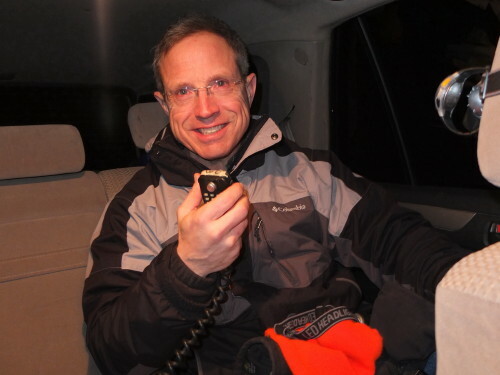 Bob K2DRH always does a great job of following us around because we each give the other dependable QSO volume as well as our supplying needed mults for Bob. He again followed us around well but contacts on 222 and 432 were much more difficult than most years. In past years we've been successful on 902 and 1296. We both spent considerable time and effort on getting completions on those bands but all to no avail (on 902 and 1296). For EN64 we revisited a spot in the SW corner of Manitowoc. It's in an industrial park and the parking lot of the factory is empty which lets us turn in circles easily. Most of the equipment seemed to work ok on this rove. 1296 had S8 noise at the first four locations. When I installed the 1296 and the 903 rigs they were sitting in place and almost touching. I use HEAVY DUTY Anderson PowerPole connectors for those two rigs. One was already hooked to DC power. Switches on both rigs were off. Yet, as I hooked up the 2nd rig (can't remember which was 2nd) there was a spark between the two cases. Odd. The fact that the 1296 worked pretty well from the 5th location onward is also puzzling. I now recall that at the first spot in EN62 (near the airport) it was S8-9 noise in almost all directions but as I spun the car, I remember finding one direction that was an S3. So it just might be the locations. Or something in my set-up is mixing easily to yield spurious noise in those locations. The lane into the tower site we found last year was snowed in. So we had to operate out on the road and gave up a few feet of altitude. In the picture on the left, Mountain, WI is about 20 miles distant in that direction (NW). In the picture below and to the left, sometimes I grabbed the mike and did some operating from the front seat. I twisted around and reached back for the straight key from time-to-time as well. I've operated many times on Pristine Rd. You head E out of Coleman on B and turn north on Pristine Rd. About 1/3 of a mile north there is a field pull-off that we use when there is no snow. When there is snow, we just park on the road. There was no traffic. This picture to the left is at about 2215 local on a Sunday night 7 miles to the nearest town. Kinda in the middle of nowhere. It's about an 8 second exposure. This was the direction we pointed for Eau Claire EN44 and the Twin Cities EN34. This is right near the end of the contest. We noted that activity REALLY fell off this year in the last hour. Most years there is quite a bit of activity in the last hour. We CQ'd and CQ'd in all of the key directions to dead air. We were both tired by this point :-) . Finally, in the last 15 minutes of the contest, I CQ'd on 144.200 and found KA0RYT in EN35 and WA9KRT in EN61. 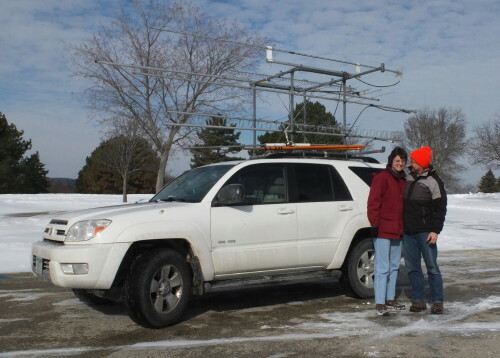 After the contest was over, we took down the 6m antenna. Temps had fallen again and it was pretty brutal--tears and all. We took a time exposure picture and then hopped in the car to drive 1.5 hours to a hotel in Appleton, WI. This put us much closer to Janice's home on Monday morning where she was still able to get a half-day of work in. Here is the special QSL card we will send out this year. Let me know if you'd like one for your collection. I upload to LOTW. I break up my big ADIF file into smaller files that I sign from each specific grid. 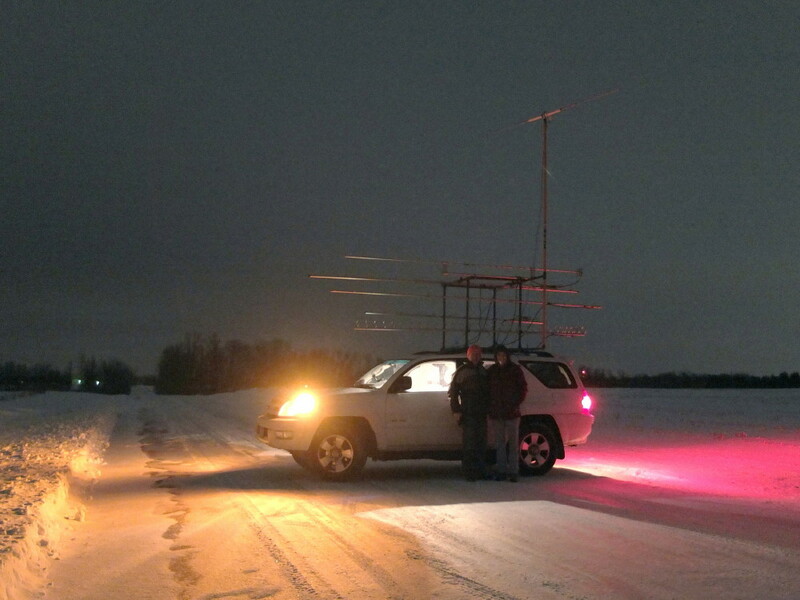 I've built "locations" in TQSL that I'm able to re-use from year-to-year. This picture is taken in EN62 on the north side of the Milwaukee airport. We had a good time on this rove. The highlight was our engagement! But another highlight was getting to work our friends in the region multiple times and see how conditions and locations varied. 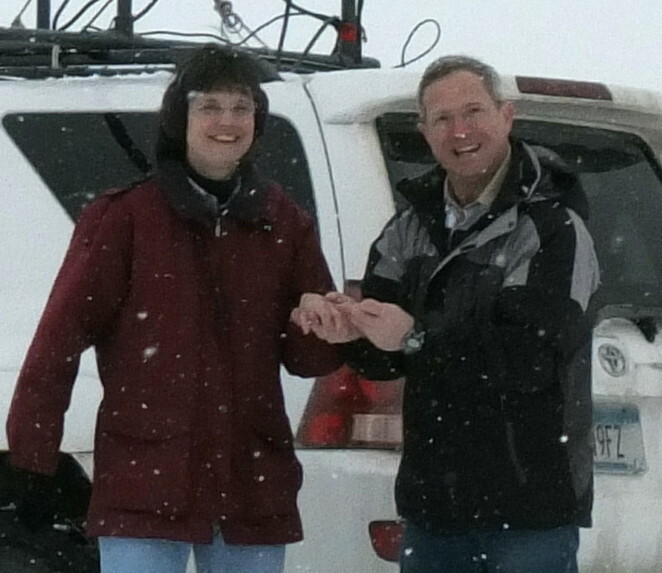 This was an important contest and event--our engagement! We will marry in October 2014. 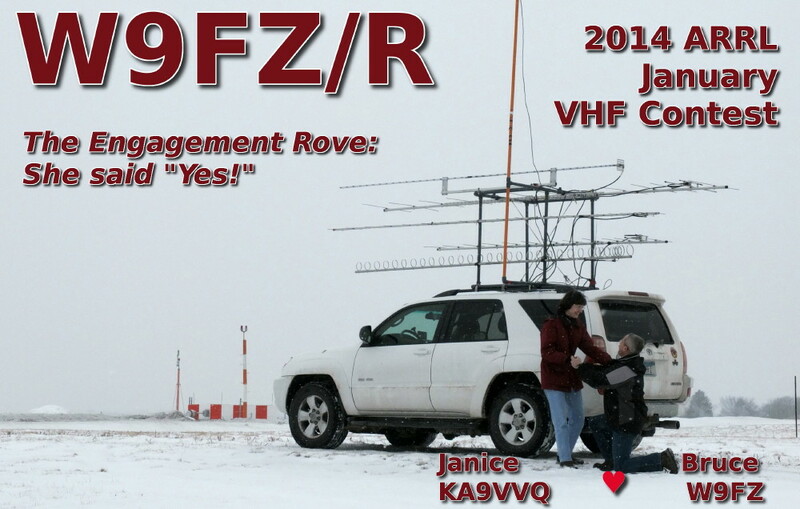 See you in July for CQ-VHF or Sept VHF!